This dynamic apartment immediately caught my eye while I was looking on the Marie Claire Maison website today. Located in Paris, It is the home of architect Anne Geistdoerfer and her family. Anne has injected loads of creativity and style into the light, open spaces. 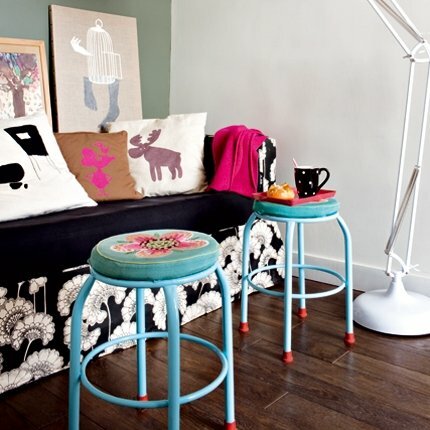 Designer furniture, pops of bright colour and fun, quirky objects are seen throughout the home. The dining area is situated on the mezzanine floor. A white lacquered table has both a bench seat and gorgeous Norman Cherner chairs. The black and white photo on the wall above is by Derek Hudson. 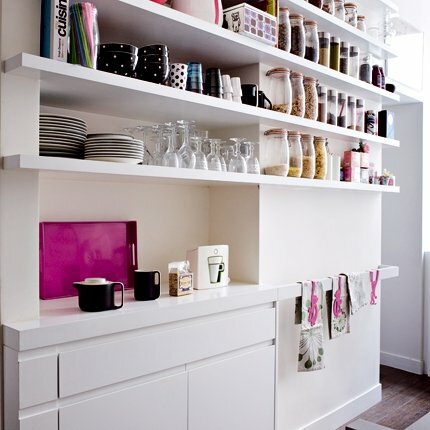 I love the fuchsia pops in the all white kitchen. Brightly coloured stools look amazing against the black and white floral sofa. Playful art and cushions give this breakfast area a whimsical feel. 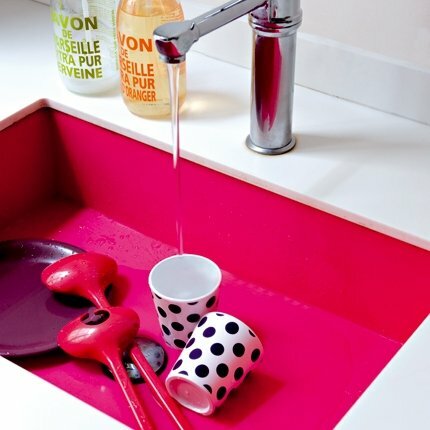 This fuchsia resin sink (custom made ​​by Kudeta) looks amazing against the white of the room. 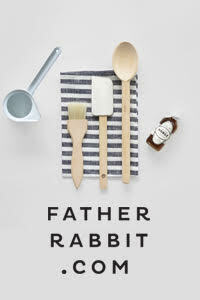 Fun kitchenware and Savon De Marseille liquid soaps complete the look. A sweet girls room, full of treasures. I love the Ikea lamp which has been painted pink. The printed linen curtain looks striking and also provides a way of hiding storage shelves. While the rest of the house is vibrant, the master bedroom has a pared-back, softer feel. Muted colours in taupe and purple look lovely against the wood of the side table and ceiling beams. I love the wall-mounted lamps. Very much a girl's room, pretty floral bedding and cushions adorn the canopy bed. There's a lot of pink in this gorgeous home, but the article says that Anne's husband had his say when it came to the 'everyday environment'. Hhmm.... I wonder what he thinks of the sink? I sure do love it - what about you? To read the entire feature, pop over here. I'm excited to be starting a new series on the blog tomorrow. 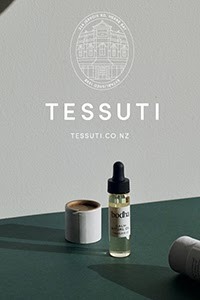 You can expect to see the very best of NZ design, so make sure you pop back! Enjoy the rest of your weekend.